Working smart means bringing maximum production from your work. In day to day life, Unix/Linux users encounter some certain set of commands which need to be executed quite frequently. Executing these commands on a regular basis may become quite irritating sometimes. Unix/Linux systems allow us to create custom commands to cope up with this situation. Instead of executing the same set of commands every time, we can put these commands in a bash script and create a custom command. 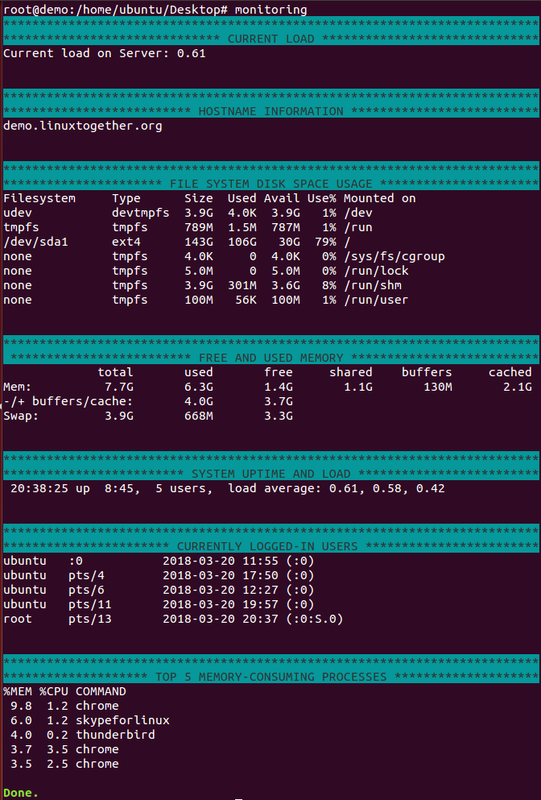 In today’s tutorial, we will create a custom command for monitoring Unix/Linux operating system with one command. We are creating a bash file with name monitoring. echo -e "\e[30;46m***** CURRENT LOAD *****\e[0m"
echo -e "\e[30;46m8***** HOSTNAME INFORMATION *****\e[0m"
echo -e "\e[30;46m***** FILE SYSTEM DISK SPACE USAGE *****\e[0m"
echo -e "\e[30;46m ***** FREE AND USED MEMORY *****\e[0m"
echo -e "\e[30;46m***** SYSTEM UPTIME AND LOAD *****\e[0m"
echo -e "\e[30;46m***** CURRENTLY LOGGED-IN USERS *****\e[0m"
echo -e "\e[30;46m***** TOP 5 MEMORY-CONSUMING PROCESSES *****\e[0m"
Creating custom commands will “cut corners” too hard way of executing the same set of commands again and again and also brings some sort of creativity and fun into Unix/Linux. This brings an end to this tutorial. Visit back to find more cool stuff. Previous story What is SSL Offloading?